A reported 800,000 people came together today on the streets of Washington, D.C. to demand the end of gun violence and mass school shootings. The March For Our Lives comes after 17 people were massacred at Marjory Stoneman Douglas High School in Parkland, Florida on February 14, 2018 due to gun violence. The march is taking place along Pennsylvania Avenue between 3rd and 12th streets in Northwest D.C. at 12:00 p.m. Supporters across the country are taking a stand with students by traveling to Washington, D.C or by attending a “sibling march” in their state. Celebrities such as George Clooney, Oprah Winfrey, Steven Spielberg and other celebrities donated hundreds of thousands of dollars in support of the march. Following that, David Hogg, a Parkland shooting survivor and activist, announced Thursday that singers such as Ariana Grande, Jennifer Hudson, Miley Cyrus and others will stand besides marchers by performing on Saturday. There are a number of items you cannot bring to the march, including coolers and selfie sticks. For a full list, click here. In addition to star-studded performances, the student-led march has inspired many families around the D.C. metro area to seek housing for those traveling to D.C. to participate in the march. It will be chilly and dry for the march with light winds. It was in the low 30s to the start the day. Temperatures will start to warm up a little by noon with temperatures in the low 40s. Temperatures will be in the high 40s by 6 p.m. Click here for full forecast. In regards to the Washington, D.C. event, petitioners are said to be worried that visitors coming to the nation’s capital will be confused about the Smart Trip cards and Metro fare rules, which could add serious delays. Metro began operating on rush hour service at 7 a.m., however train arrival time might be delayed considering the Cherry Blossom visitor season begins the same morning. According to Metro’s March For Our Lives rider guide, the closet Metro station to the march is located at the Archives-Navy Memorial station. 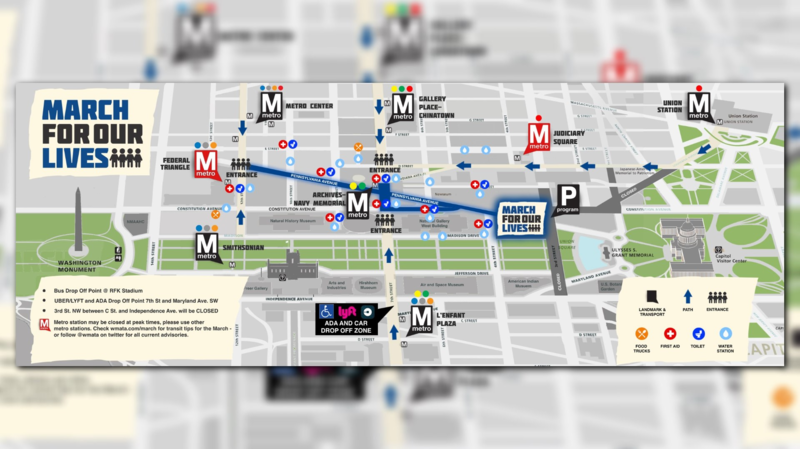 The rider-guide suggests for marchers to arrive early and plan ahead by purchasing a SmarTrip pass before arriving at a station. Metro also says that bicycles, large coolers, or oversized items will not be allowed on trains on March 24. Their rider-guide includes step-by-step instruction on how to arrive at the march depending on what station you arrive at. For more information check out their rider-guide for March 24. If you're looking for a bathroom along the route, there will be plenty of options as several churches and buildings will be open to marchers. Several restaurants are offering discounts and freebies to marchers and Lyft is proving free rides. For more information regarding the March For Our Lives, check out their official Facebook page and website.